marble monuments shall not outlive this rhyme. air meets sunshine rising high in the sky. in harmony with the stars. feather rain dreaming field over forest. the scent of virtue more fragrant than jasmine. this almost invisible perfect stillness. from them stay tranquil and be diligent. find beauty in nature and in yourself. good cup of tea, the cat mewed in answer. hear the streams in the flowering meadow. the saints love everyone, see all as good. speak of love of which who knows the meaning. 55 our hands touching in prayer. stars grow faint, crows and magpies fly south. the harp breaks out in sweet music of pain. on the newborn babe virtue in abundance. When mind is happy, the universe is happy. Keep Buddha Mind the great sea of wisdom. our doubts & concepts make it difficult. light blends with light merging into Oneness. the fog disappears, the hawk soars skyward. guiding us upward to our celestial home. sprouting wings, realizing the eternal. For the context of sources for the lines, consult my web pages On the Number 55 to see how this poem was constructed. Despite the difference in space and time of the composition of each line, what unites these writers quoted is the number 55. That is, the writer's words appeared in verse 55, sonnet 55, chapter 55, line 55, or page 55. This poem is a mosaic from some 64 poets and philosophers all over the world. The sources date from the Rig Veda of India (1500 BC), the I Ching of China (1000 BC), and Plato's Timaeus of Greece (360 BC) to modern American poets such as Mary Oliver's The Leaf and the Cloud (2000). Because the number 55 is associated with the Platonic Lambda and the "Soul of the Universe", an extra effort was made to include philosophical and poetical passages that are positive in outlook. It is from this subjective selections of inspired writing that this poem was constructed. May this poem refresh the reader's spirit to find in the words of Wang Wei that within us "a lamp is always lit" that surpasses the splendor of the stars. "Light" is the 55th word of Genesis I. King David sings of this light in Psalms 27.1: "The Lord is my light." and in Psalms 28.7: "The Lord is my strength and my shield... my heart greatly rejoiceth; and with my song will I praise him." This sentence is the first line uttered by Mary Magdalene in Chapter 55 of the Pistis Sophia (circa 150 A.D.) to Jesus. I've chosen to begin this poem Meditations on 55 with "O Light forget not my song of praise" in honor of the Platonic Lambda the Soul of the Universe. 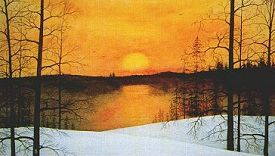 These music pieces are both Opus #55 Beethoven's Eroica Symphony #3 (1803) and Sibelius's Tone poem Nightride and Sunrise (1908). Beethoven's Eroica Symphony #3 in E flat, Op. 55 is one of his most famous works. It was originally dedicated to Napoleon Bonaparte. Beethoven had admired the ideals of the French Revolution embodied in Napoleon, but when he crowned himself Emperor of France in 1804, Beethoven was apparently so disgusted that he erased Napoleon's name from the title page with such force that he broke his pen. J.W.N. Sullivan (Beethoven, 1927) sees the Eroica Symphony as "a transcription of personal experience". In the 1st movement (Allegro con brio) we find Beethoven's courage in defying fate. In the 2nd movement (Marcia funebre: Adagio assai), a lapse into despair brought on by his deafness (1797). In the 3rd movement (Scherzo & Trio: Allegro vivace. Alla breve), he celebrates the emergence out of depression into a new outburst of creative energy ("From today on I will take a new path": Letter to Krumpholz, 1802). In the 4th movement (Finale: Allegro molto Poco andante Presto), the variation form symbolizes the range of achievement now open to his newly-fired "Promethean" spirit. 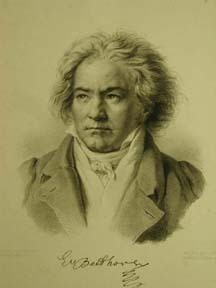 That Beethoven's Eroica Symphony was composed (June-October 1803), a year after his Heiligenstadt Testament suicide note (Oct. 6, 1802), shows how one can rise spiritually out of despair to revolutionize symphonic music, uplifted by one's love and devotion to art (More on Beethoven's Eroica Symphony). Father is used here not only as the One in the Trinity, but as the Tao, the source of everything. Father is a symbol to indicate Absolute Being the First or unmanifest Logos, the Source of all that is. It is a "thrice unknown Darkness" [G.A. Gaskell, Dictionary of All Scriptures and Myths (1960), p. 268]. "Whatsoever ye shall ask the Father in my name, he will give it you." (John 16.23) suggests that God will give you what you ask for in prayer. But if we understand God = Father = Consciousness, then God is conscious of our needs even before we pray for it. The Chinese sage, Chou Tun-yi (1017-1073) opens his book Penetrating the Book of Changes, Chapter 1 with this insight: "Sincerity is the foundation of the sage. Great is the ch'ien [First hexagram of the I Ching, The Creative], the originator! All things obtain their beginning from it. It is the source of sincerity. 'The Creative's way is to change and transform so that everything will obtain its correct nature and destiny.' In this way sincerity is established. It is pure and perfectly good. Therefore 'the successive movement of yin and yang constitutes the Tao. What comes for the Tao is good, and that which realizes it is the individual nature.' Origination and flourish characterize the penetration of sincerity, and advantage and firmness are its completion. Great is the Change, the source of nature and destiny." The nightingale is a bird who sings of love, but it is also a symbol of the connection between love and death. Shakespeare cites the nightingale 14 times, notably in Romeo and Juliet, III.5.2-5: "Nightly she sings on yon pomegranate-tree: / Believe me, love, it was the nightingale." not by the wine of Bacchus or drugs but on the inspired wings of poetry (commentary). In The Conference of the Birds, a Sufi fable by Farid ud-Din Attar (d. 1230), we find "Salutations, O Nightingale of the Garden of Love! Open your melodious throat and sing of spiritual things. By your songs show men the true Way." The nightingale as the first bird to speak at the conference: The amorous Nightingale poured emotion into each of the thousand notes of his song, and in each was to be found a world of secrets. When he sang of these mysteries the birds became silent. 'The secrets of love are known to me,' he said. 'All night I repeat my songs of love... I create a tumult among the roses as well as in the hearts of lovers. Always I teach new mysteries, at each instant I repeat new songs of sadness. When love overpowers my soul my singing is as the sighing sea. ' (translated by C. S. Nott, Shambhala, Boston, 1993, pp. 9, 14). that their Good is close at hand." "the purest possible activity of thought"
Plato (428-348 B.C.) writes (Republic, VI.505a): "the greatest thing to learn is the idea of the Good by reference to which just things and all the rest become useful and beneficial." He continues (Republic, VII.518c): "the soul is able to endure the contemplation of essence and the brightest region of being is the Good." Plotinus (204-270 A.D.) writes (The Enneads, I.vii.1): "Existing beyond and above Being, It must be beyond and above Act, Mind, or Intellection. That only can be named the Good to which all is bound and Itself to none. It must be unmoved while all circles around It, as a circumference around a centre from which all the radii proceed." He continues (The Enneads, I.viii.2, II.ix.1): "The Good is beyond beautiful, beyond the Highest, holding kingly state in that Intellectual Cosmos of which the Principle is wholly unlike what is known as intelligence in us... This the One and the Good is our First principle, next to it follows Divine Mind, the Primal Thinker, and upon this follows Soul. Such is the order in nature." I've combined Pythagoras and Plato in this line because we do not see "the Good is close at hand" unless we have "purity of thought" (mind without agitations and rambling cravings). When our mind is clear and still, we may share in Dante's experience: "my vision reached the Infinite Goodness" (Paradiso, XXXIII.81) and his ensuing cosmic enlightenment. is being like the sun, free from the clouds of desires and cravings. This line is from James Joyce, Ulysses, page 55 (1922). "Do you understand the New Year?" Silence is better than holiness. convoluted and intellectual, the Master will say "Have a cup of tea!" are quietened. When the mind is still, spiritual awakening occurs. who quoted from Tcheou Tun-yi (1017-1073), a Neo-Confucian sage. The nature of the two fountains are not identified, but in Surah 47.15 there is mention of the rivers of milk and honey. Palm branches represent triumph and victory and is a solar symbolism (Revelations, VII.9). Palm Sunday festival celebrates the triumphal entry of Jesus into Jerusalem. In Christian art, martyrs were usually shown holding palms representing the victory of spirit over flesh. In Judaism, the palm represents peace and plenty, and is one of the Four Species of Sukkot; the palm may also symbolize the Tree of Life in Kabbalah. The palm tree was a sacred sign of Apollo in Ancient Greece because he had been born under one in Delos. Jewish tradition teaches that the pomegranate is a symbol for righteousness, because it is said to have 613 seeds which corresponds with the 613 mitzvot or commandments of the Torah. In Exodus, XXVIII.33-34, pomegranate images were woven onto the borders of Hebrew priestly robes. In I. Kings, VII.18-20, pomegranates were depicted on the Temple of Solomon built in Jersusalem. The myth of Persephone, the dark goddess of the Underworld, also prominently features the pomegranate. Hades tricked Persephone into eating six pomegranate seeds while she was his prisoner. Because of this, she was condemned to spend six months in the Underworld every year. Her mother Demeter mourns and no longer gives fertility to the earth. This was the Greek's rationale for the seasons. The pomegranate also evoked the presence of the Aegean Triple Goddess who evolved into the Olympian Hera, who is sometimes represented offering pomegranates. Since pomegranates are associated with female Greek goddesses, we may consider it a lunar symbolism. Then we may associate palms and pomegranate with the sun & moon, day & night, male & female. The two fountains that flow are yin & yang or the two streams of even doubling and odd tripling numbers issuing from the One of the Platonic Lambda to create the Soul of the Universe (Plato, Timaeus 35b). since Beatrice called out his name that she will be guiding him to Paradise. A sunflower displays 3 consecutive Fibonacci numbers: 21, 34, 55. Leonardo of Pisa (1175-1250) discovered the Fibonacci series that is found in the Golden Section in nature sea shell shapes, branching plants, flower petal and seeds, leaves and petal arrangements, on pineapples, artichokes, and sunflowers. When the sufi (whirling dervish) dances, he raises his right hand to heaven, and lowers his left hand to earth. This ritual dance brings the blessings of heaven to earth. 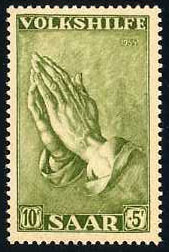 When I came across a 1955 Saar semi-postal stamp showing Dürer's Praying Hands (1508) in the Graphische Sammlung Albertina, Vienna, it inspired the ending to my poem Speculations on the Soul. Prayer is a sacred activity bringing 5 and 5 together. and "in my soaring, dreaming" is from Michael McClure's Ghost Tantras, #55.3,10 (1967). a flight of the alone to the Alone. Source from Dropping Ashes on the Buddha: Teaching of Zen Master Seung Sahn, Ch. 55 (1976). Lu Hsiang-shan (1139-1193), the Chinese sage of Elephant Mountain, proclaimed: The four directions plus upward and downward constitute space. What has gone by in the past and what is to come in the future constitute time. The universe is my mind and my mind is the universe. This is similar to Dante's vision when he saw "within a single volume bounded by love, I saw the scattered leaves of all the universe" (Paradiso XXXIII.86-87). One who lives in ego-consciousness full of cravings and a cluttered clouded mind will not experience a world of happiness when events don't go his way. The sage who lives in cosmic-consciousness without attachment and a clear mirror-like mind is always happy, at peace in harmony with the world around him. Realization of the Absolute is simple. Our thoughts and concepts make it seem difficult. I was lucky to meet Master Subramuniya (1927-2001) at the home of Professor Edelstein at Cornell (June 13, 1970). He told me this story of a student who asked him: "How long will it take for me to be enlightened if I studied with you? Ten years? Twenty years?" Master Subramuniya told him: "Why put up this barrier of ten or twenty years. You could be enlightened right now if you put your mind to it." Our true treasure is not outward possessions but inward peace. To attain such tranquillity, our mind need to be balanced with the four elements water (pearl, seashell), fire (phoenix), air (flight), earth (honeysuckle). The pearl of great price alludes to Matthew, XIII.45-46 when Christ compared it to the kingdom of heaven: "Again the kingdom of heaven is like unto a merchant man, seeking goodly pearls: Who, when he had found one pearl of great price, went and sold all that he had, and bought it." (Pearl symbolisms) The phoenix is a symbol of rebirth and eternal return. On flight symbolism see comments above relating to Plotinus in "flying off alone in my soaring" as well as below relating to Dante's eagle and Confucius' hawk in "the fog disappears, the hawk soars skyward". The honeysuckle is a symbol for bonds of love, generosity, and devoted affection. Rubens and Isabella Brant in the Honeysuckle Bower (1609) was painted by Peter Paul Rubens (1577-1640) after his return from Italy when the 32 year old Rubens married the 18 year old Isabella Brant. Honeysuckle symbolizes faithfulness, so Rubens and his bride are surrounded by honeysuckle vines. One day the great p'eng bird soars straight up to Heaven." as a giant bird whose wings span 3000 miles at a height of 90,000 miles. from Dante's Commedia. While consulting A Concordance to the Divine Commedy of Dante Alighieri, I noticed that nebbia (fog) occurs 4 times in the Inferno, 5 times in Purgatorio, with zero citations in Paradiso. When the mind is clear unclouded and at peace, we experience paradise. Conversely, we find more light (luce, lume, lome) in Dante's Commedia as we progress from Inferno (11), to Purgatorio (38), to Paradiso (134). Likewise the eagle (aquila, aguglia) appears more often on Dante's ascent from Inferno (2), to Purgatorio (4), to Paradiso (6). Since Beatrice and the eagle can stare at the sun (Paradiso, I.48), Dante must clear his mind of all doubts (fog) to experience the celestial vision. The eagle or hawk flying skyward symbolizes our mind's transcendence to heaven. Confucius writes about this in Doctrine of the Mean XII.3 (circa 500 B.C. ): "It is said in the Book of Poetry, 'the hawk flies up to heaven; the fishes leap in the deep.' This expresses how this Tao is seen above and below." After this poem was written, I found on page 55 of William Carlos Williams' Paterson (1958) these lines: "beyond which, a hawk soars!" and "the imagination soars". These images from Williams' last work lend further support that when our mind is clear without clutter, our imagination soars skyward like a hawk. Wang Wei (701-761) was a Tang Dynasty Chinese poet, musician, painter and statesman. He spent ten years studying with the Zen master Daoguang. Since Wang Wei was a Buddhist, he surely must have known Buddha's dying words to his disciples "Be the lamp unto yourself." This advice is for spiritual aspirants to find enlightenment within oneself through meditation and not to rely so much on others such as gurus or books. Was Wang Wei aware that the earth was round, that when the sun sets in the East, it is rising in the West. The real sun is always shining, the illusion of sunrise and sunset is due to the earth's rotation. Thus when there is sunset in San Francisco (7:10 pm, 9/19/2006), there is sunrise on the other side of the globe in Moscow (7:10 am, 9/20/2006). The lamp that is alway lit may also refer to the Divine Eye in us alluded by Christ (Luke XI.34): "The light of the body is the eye: therefore when thine eye is single, thy whole body also is full of light." Plato also mentions it (Republic, VII.527e): "there is in every soul an organ or instrument of knowledge that is purified and kindled afresh by philosophic studies when it has been destroyed and blinded by our ordinary pursuits, a faculty whose preservation outweighs ten thousand eyes, for by it alone is reality beheld." If you've not experienced yet this ever-lit lamp within, ask yourself what is lighting up your dream world when your eyes are closed in sleep? or had sprouted wings and were flying up to join the immortals. This appears in Allen Ginsberg's Poem 55 "Variations on Ma Rainey's See See Rider" of his last book Death & Fame (1999). Lines 12-13: "see what I want today / yes yes yes". It also appears in the last line of Molly Bloom's inner monologue that ends James Joyce's Ulysses (1922): "and his heart was going like mad and yes I said yes I will Yes." Yes I Said Yes I Will Yes is a book by Nola Tully (Vintage 2004) subtitled "A Celebration of James Joyce, Ulysses, and 100 Years of Bloomsday". On the fictional morning of June 16, 1904 Bloomsday, as it has come to be known Mr. Leopold Bloom set out from his home at 7 Eccles Street and began his day's journey through Dublin life in the pages of James Joyce's novel Ulysses. This book commemorates the 100th anniversary of Bloomsday. James Joyce wanted to end his novel Ulysses on "the most positive word in the English language". These three positive words come after Allen Ginsberg's "see what I want today" "yes yes yes" in his Poem 55 of Death & Fame. I've chosen them to end this poem "O Light Forget Not My Song" in the same spirit on this Meditation on 55 a song of praise to the Soul of the Universe.